Painting in Renaissance art continued to progress in art history from the Gothic period, toward more realism and three dimensions, reaching a peak during the High Renaissance. Famous artists, Painters and sculptors, competed vigorously against each other and many times were influenced by each other. Sometimes characteristics of a one artists famous paintings can be traced and attributed to the art of another artist, documented in their travel logs. The ability to travel and view work of other artisans accelerated the development of the Renaissance art. Recognizable artists of this period are Leonardo da Vinci, Michelangelo, Raphael, and Titian. The artists of the Renaissance continued a trend toward realistically representing the world as it was mostly in religious themes, a trend, in the Gothic Art Period. Artists rendered greater facial expressions revealing feelings and intimacy. Figures began to move within the picture plane interacting with each other, relating stories and incidents that artists wished to reveal. To make Figures appear to exist in space, on a two-dimensional surface a few artists in the Renaissance art period developed a system of one point perspective, a mathematical system where all edges and forms follow orthogonal lines converging on a single point. Buildings and objects that existed within these lines and used these lines become smaller and smaller as they approached a single point called a vanishing point. The diminishing sizes of all kinds objects in this system create depth and a true size relationship to each other within the painting. Some Artists in Renaissance art softened the edges of their figures and objects blending them into the landscape, the farther the objects appeared from the eye the more amorphous they became. This technique is atmospheric perspective adding a more perceived three dimensional depth and believability to an Artists’ work. With a trend toward more realism artists in history began to render the human form, using foreshortening and chiaroscuro, achieving a heightened illusion of depth on a two dimensional surface. The closer artists came to High Renaissance art the more classical, monumental, and ideal the figures became. Famous paintings in the High Renaissance had grandeur, idealism, and soft rendering of details. Some artists too became interested in the immediacy of the moment or how things looked in an instant of time. This led to an interest in the sublime, man fighting against man, good against evil to the death, the action of the moment with all its emotion and expression. To view selected paintings scroll down and click on the icons below. 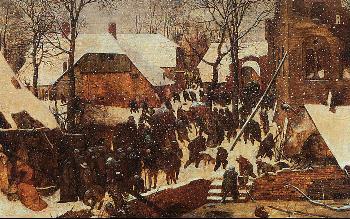 Some famous artists of the Renaissance period in art history were Titian, “Cain killing Able”, Giorgione, “The Tempest”, and Pieter Bruegel the Elder, “Winter Landscape”. To view and learn about particular artists of this period, click on their names below.